We offer our customers a wide range of automatic band saw blade grinders. our automatic bandsaw blade grinders has been designed to achieve fast cutting speed with the minimum tool cost as well as minimum maintenance and running cost. 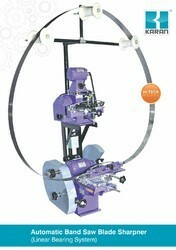 These automatic bandsaw blade grinders are available at industrial leading price. » Ele. Motor: 0.25 H.P., 3Phase, 960 RPM. We offer our customers a wide range of Automatic Band Saw Blade Grinder. Our automatic band saw blade grinders has been designed to achieve fast cutting speed with the minimum tool cost as well as minimum maintenance and running cost. 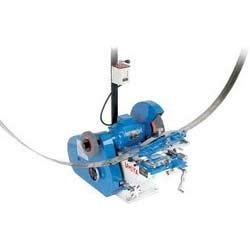 These automatic band saw blade grinders are available at industrial leading price. - Blade Size 13" 18" 24"
- Grinding Wheel Size 6" X 0.5" 6" X 0.5" 6" X 0.5"
» Ele. motor: 1H.P., 2880 RPM, 3 phase OR 1 phase. » Capacity: 1" to 3" width, 2T.P.I. » Sharpening speed: 90 to 95 teeth per mnt. - Ele, motor : 1HP, 2880 RAM, 3 phase OR 1 phase. - Capacity: 1" to 3" width, 2T.P.I.